Best value tank. For 35mm only. Best value tank, very compact. Ideal where low volumes of 35mm are to be developed or for those new to analogue photography. Made by AP Photo Industries, these tanks exhibit superior properties to the industry standard "Paterson" tanks. 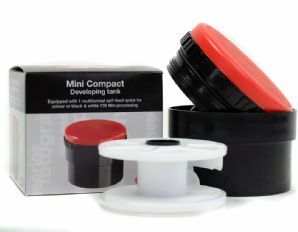 Importantly, they feature an o-ring sealed lid for minimal leakage (a contstant problem with the Paterson tanks). Furthermore, the AP reel is easier to load than the Paterson equivilent, yet remains completely compatible with Paterson tanks, therefore ideal for anyone who already has a Paterson tank.